The CAAD Department is located on ETH's Hönggerberg campus. To reach the Hönggerberg campus from the main train station (Hauptbahnhof), take tram 11 direction Auzelg to Bucheggplatz. Switch there to bus 69 direction Hönggerberg, and exit at this final stop. The trip takes about 25 minutes. 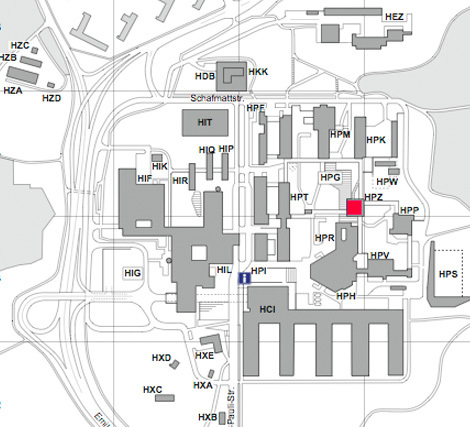 To reach the Hönggerberg campus from the airport, take the S2 or S16 commuter train direction Zurich city and exit at the Oerlikon stop. 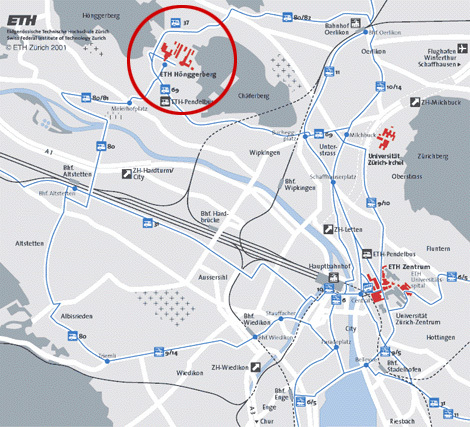 Switch to the 80 bus direction Triemli, and exit at the ETH Hönggerberg stop. The trip takes just over half an hour.